Fusing Amir Khusro's kalaam with trance music, Kanishk Seth Trio is a group of three young experimental musicians from Mumbai. 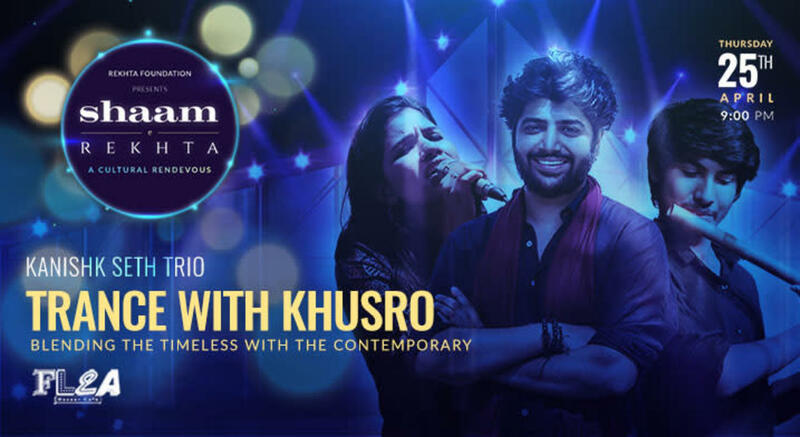 After producing and composing songs for world's first Sufi-electronic album called Trance With Khusrow that was nominated for GIMA and Mirchi Music Awards in the Best Fusion Category, Kanishk Seth will be performing classics of Amir Khusro and traditional thumris alongside Devashri Manohar and Adwait Kashikar to create a surreal musical experience for audiences. Come and join us for an unforgettable evening of live music and immerse yourself in the unmatched beauty of Khusro's poetry. Along with classically trained vocalist Devashri Manohar and flautist Adwait Kashikar, talented musician Kanishk Seth is all set to bring alive the remarkable legacy of Amir Khusro, the brilliant Sufi poet and scholar of the late 13th century who is remembered as the 'father of Urdu literature'. Blending the timeless with the contemporary, the group will celebrate the spirit of Urdu by paying tribute to Khusro with their music. Shaam-e-Rekhta is a tribute to the splendid legacy of Urdu and a celebration of its timeless beauty. Defining grace, lyrical beauty and stirring a multitude of emotions, Urdu as a language inhabits a magnificent world of its own. To commemorate the phenomenal outreach of Urdu across the world, this intimate event invites Urdu lovers, artists and all those whose hearts and minds have been touched by the language to spend an evening celebrating it.